I’ve been fighting a pretty nasty cold all week, so I’m staying in this New Year’s Eve. I don’t really have the energy for a recap either, so just a few happenings since my last post! 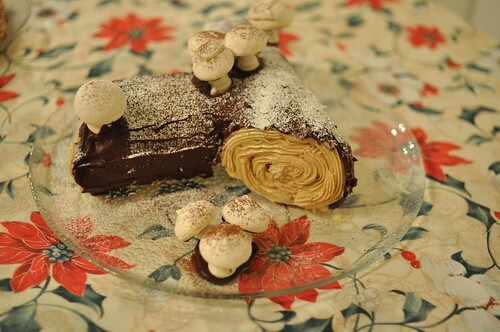 My yule log was beautiful – unfortunately the cake was kinda dry. I really liked the frosting though – Swiss Meringue buttercream, flavoured with instant espresso powder and vanilla. I’d definitely make that, and the meringue mushrooms again. I knit an Attabi cowl in one day, out of Berroco Blackstone Tweed – it’s a sample that I’m taking with me to the January TNNA show next week. I love the deep purple! Not so much a single day project (I had to keep ripping out for sizing), but on Christmas and a few days afterwards I knit this cowl out of Malabrigo Twist. It’s reversible, and super quick and fun! I used 2 skeins – look for the pattern in January. That’s about it! Tonight I’m knitting, relaxing, and trying to kick this cold. Hope your New Year’s is fun. Love the stitch pattern in that bottom photo. Attabi looks great! I never noticed you did a cowl pattern as well. 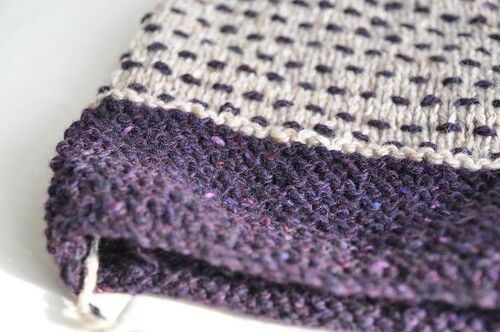 Might work up nicely using some sock yarn and adjusting for gauge – what do you think? Beautiful cake and lovely knitting too! 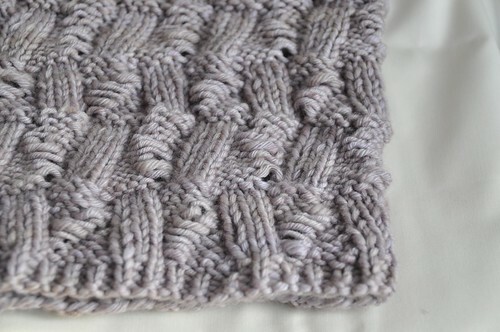 Look forward to the new cowl pattern. We’ve all been fighting a stubborn cold virus here too — can’t get rid of the darned thing. Hope you’re well soon & have a wonderful new year! Mmm, yummy looking cake and knits! Everyone I know has been sick over the holidays (me too) – feel better soon! Feel better. Happy New Year! mm malabrigo twist! seems like it would be a delight to work with, love the cowls! Hi!! I can´t find where to buy the pattern of the second cowl you made, the gray one?? ?